Bobby Womack just died today, safe journey, It's All Over now. Edited 1 time(s). Last edit at 2014-06-29 10:41 by bv. Before he became a solo artist, Bobby was on many of the Muscle Shoals/Aretha and Pickett sessions. That's crazy, If You Think You're Lonely Now popped up on my ipod this afternoon and It got me thinking about his connection to the Stones. Now this. That is sad news. I spent a lot of time with Bobby Womack last year, listening to The Bravest Man in the Universe. May he rest in peace and may his family find comfort in his memory. he had quite some dates booked through July and August. Womack was born in Cleveland, Ohio, the third of five brothers. His father, Friendly Womack, spotted Bobby's talent on the guitar at an early age, and Bobby was only 10 when he and the rest of his family started touring the midwest gospel circuit as the Womack Brothers, accompanied by their mother on the organ and their father on the guitar. They soon came to the attention of Cooke, who signed them to his label SAR in 1961. Cooke changed their name to the Valentinos, relocated them to Los Angeles and encouraged them to take the same journey from gospel to secular R&B that he had taken. Bobby's speciality was to contribute unorthodox rhythm guitar lines – although he was left-handed, he played a right-handed guitar upside down without changing the stringing – but he would occasionally sing lead vocals. He was also the band's main songwriter: a 1964 single he wrote for the Valentinos, It's All Over Now, was covered by the Rolling Stones and taken to the top of the UK chart. Womack was initially furious about this appropriation, although his anger subsided with each subsequent royalty cheque. He later toured with the Stones and appeared on their 1986 album Dirty Work. Womack was also a member of Cooke's band, touring and recording with him from 1961. Cooke's death in December 1964 hit him hard. He grew close to Cooke's widow, Barbara, 10 years his senior. When they married, only three months after Cooke's funeral, it was seen by many as a betrayal. Womack fell out with his brothers, was booed at concerts and was severely beaten up by Barbara's brother. The first solo records he recorded for the labels Him and Checker were all but ignored. Undeterred, Womack continued to work as a session musician. Between 1965 and 1968 he toured and recorded with Ray Charles, quitting, he claimed, because of Charles's tendency to pilot his own personal jet. He later moved to Memphis to work at Chips Moman's American Studios, where he played the guitar on recordings by Presley (Suspicious Minds), Franklin (Rock Steady), Springfield (Son of a Preacher Man), the Box Tops (The Letter) and Pickett (I'm a Midnight Mover). Womack also wrote 17 songs during this period, and gave all of them to Pickett; with none of his own material left, Womack cut an album of covers in 1968. Ironically, his unorthodox R&B versions of Fly Me to the Moon and California Dreamin' became Womack's first solo hits in the US. Further collaborations followed: in 1969 he started writing with the jazz guitarist Gabor Szabo (their song Breezin' later became a hit for George Benson); in 1970 he co-wrote a track on Janis Joplin's last album, Pearl (his sportscar also inspired Joplin to write Mercedes Benz); the following year Womack's guitar, bass and backing vocals were crucial to Sly Stone's LP There's a Riot Going On. By this time, Womack's personal life was deteriorating. He split with Barbara in 1970 when she found him in bed with her 18-year-old daughter Linda. (Linda later married Bobby's younger brother Cecil and formed the duo Womack & Womack). But, despite a wrecked marriage and a cocaine habit, Womack was to start his most successful spell as a solo singer. He signed to United Artists, where his albums Communication (1971) and Understanding (1972) chalked up R&B hits including That's the Way I Feel About 'Cha and Woman's Gotta Have It. In 1972 he provided the soundtrack for Barry Shear's blaxploitation movie Across 110th Street: the title track would prove to be his most enduring single, later included in films by Quentin Tarantino and Ridley Scott. Salvation came in the form of a 1980 hit single, Inherit the Wind, which he sang and co-wrote with Wilton Felder of the Crusaders, and his solo career picked up once more. The Poet (1981) and The Poet II (1984) saw him move into the modern soul pioneered by Teddy Pendergrass and Luther Vandross. Both albums were critical and commercial successes (The Poet II was the NME's album of the year in 1984) but Womack saw little money from them, and spent much of the decade in protracted legal wrangling with his record label. There was a scattering of albums through the late 80s and 90s (including an LP of Christmas carols in 1999) and some odd collaborations (with Living in a Box, Todd Rundgren, the Wu-Tang Clan and Lulu). In more recent years, artists such as 50 Cent, Ghostface Killah and Black Star began plundering Womack's early 70s canon for samples. Womack was inducted into the Rock and Roll Hall of Fame in 2009. 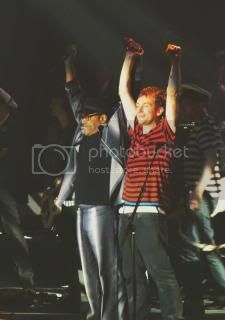 In 2010 Damon Albarn invited him to guest on the fourth Gorillaz album, for which Womack sang and co-wrote the single Stylo. Albarn later co-produced Womack's album The Bravest Man in the Universe (2012). "I was ostracised from the music community aged 21 when I married Sam Cooke's widow," said Womack. "After 45 years, I feel like Damon has welcomed me back in." Womack's son, Vincent, from his marriage to Barbara, took his own life in 1988. He is survived by his second son Bobby Truth and a daughter, Gina, both from his marriage to Regina; and by two sons, Cory and Jordan, from a relationship with Jody Laba, Cory and Jordan. Sad news indeed. His influence on Ronnie's Now Look album was huge. I think he added a warm soulful sound to many of those tracks. RIP. I was looking forward to seeing him perform on Labor Day weekend. Too much cocaine and Alzheimer disease have killed him. Very sad news. I was introduced to him by Ronnie Wood via the great Now Look album. All his early 70s albums are worth checking out. RIP Bobby Womack. Very sad news. 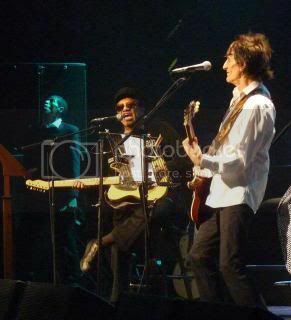 I used to listen to Bobby a lot in the 1980s and was thrilled to see him guest on two songs with Ronnie and Mick Taylor at the wonderful Jimmy Reed tribute they did at the Royal Albert Hall in November 2013. RIP the man with a very special and unique voice. The man who, to quote Ronnie's tweet, could make you cry when he sang. Very sad news. I remember he was playing in London on the same day as the Stones were playing at the O2 Arena in 2012, and I couldn't see him. RIP. Very sad news. A great voice gone. Nice photo, Neil. I was there too. Same from me, I'm afraid. B.W. was a very talented man who will be missed. I expect our boys will be revising one selection in the set list in tribute for the next show.